Parkman Tavern, Concord, MA – where the “Shot heard ’round the world” happened that signified the start of The American Revolution War. The Parkman Tavern is an historic tavern (now a private residence) at 20 Powder Mill Road in Concord, Massachusetts. The 2-1/2 story timber frame house was built in 1659 by a member of the locally prominent Wheeler family. In the late 18th century it was purchased by William Parkman, great-uncle to historian Francis Parkman, who operated a tavern on the premises. Biography: William Parkman (1741-1832) was born in Westborough, Massachusetts (the eighth of seventeen children of Reverend Ebeneezer Parkman of Westborough, Mass). He worked as a carpenter and surveyor until about 1770, when he moved to Concord, Massachusetts, and purchased a farm. In addition to his work on the farm, he served as deputy sheriff from 1770 to 1795. At this time, his farm also functioned as a tavern specifically for teamsters. In 1778, he was appointed Deacon to the First Church of Concord. In 1795, having moved close to the town center, he became a shopkeeper and postmaster, a position he held until 1810. Meanwhile, William Parkman also served as a Justice of the Peace. From 1798 to 1825, he was a member of the Social Circle in Concord. Parkman had eight children with wife Lydia Adams, to whom he was married from 1766 to 1787. He second wife (1789-1810) was Lydia Proctor. His third wife was Sarah Wheeler, who was the mother-in-law of Parkman’s fifth daughter, Sarah. They remained married from 1811 until William Parkman’s death in 1832. The house was listed on the National Register of Historic Places in 1979. Revere and Dawes reached the Clarke home in Lexington around midnight and delivered their warning. Suspicious as to why a such a large force of British Regulars would be needed to arrest Adams and Hancock, they realized the real target must be stores of munitions hidden by the Colonists in Concord, a few miles to the west. 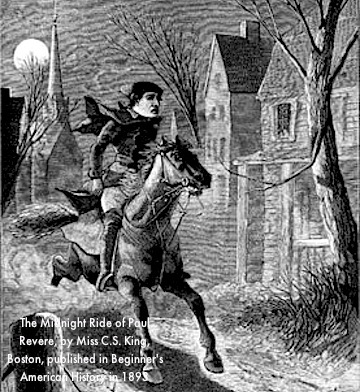 Revere and Dawes jumped back on their horses and headed to Concord – but Longfellow also fails to mention that Dr. Samuel Prescott also joined them along the way. Dr. Prescott, a Concord local, had been visiting his girlfriend. The three men decided to ride toward Concord and stop at every house along the way (which surely included the Parkman Tavern) to warn the residents about the British movements. The link to Benjamin’s immigrant father was provided by Robert V Darst.On 18 April 2010, Michael Bogoslawskiprovided the following information;The Darst family came to the Valley from Switzerland via Pennsylvania. This entry was posted on January 1, 2010 at 9:26 pm and is filed under Uncategorized. You can follow any responses to this entry through the RSS 2.0 feed. You can leave a response, or trackback from your own site.